Author/Opus: This is the 54th puzzle from our contributing puzzlemaster John Bulten. 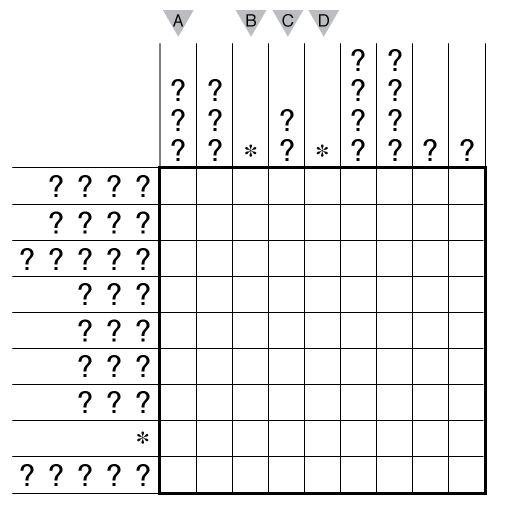 Rules: This puzzle is a combination of Cross the Streams and Cave rules (with the exception of having multiple “caves” that all connect to the edge of the grid). Shade some empty cells black to create a single group of black cells that are all connected to each other through their edges. No 2×2 cell area within the grid contains all black cells. 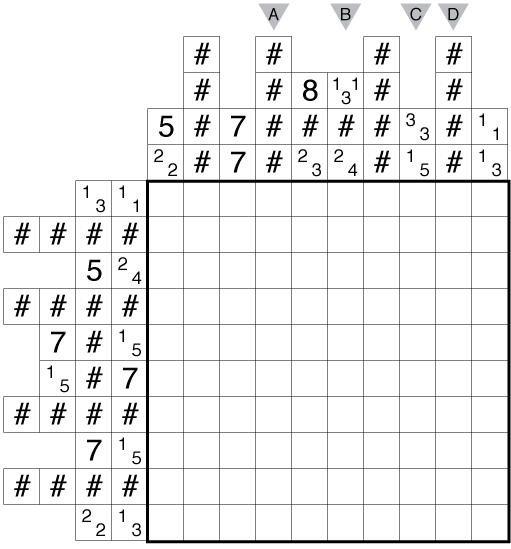 Numbers to the left/top of the grid represent the groups of consecutive black cells which are in that row/column in order, either from left to right or from top to bottom. A question mark (?) represents a group of consecutive black cells whose size is unknown; an asterisk (*) represents any number of unknown groups of black cells, including none at all. 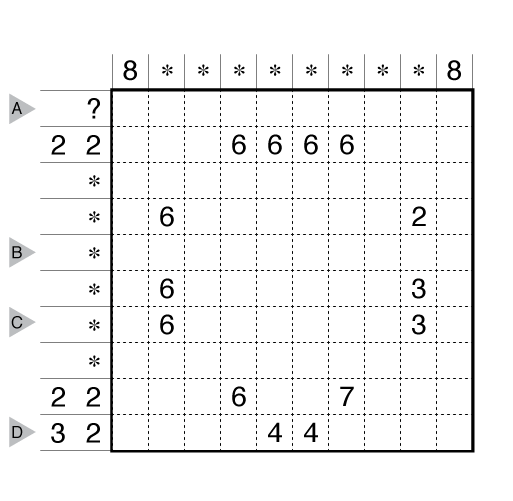 All white cells must be connected via other white cells to an edge of the grid. All numbered cells inside the grid must be white and each number in these cells indicates the total count of white cells connected vertically and horizontally to the numbered cell including the cell itself. Answer String: Enter the length in cells of each of the (white) cave segments from left to right for the marked rows, starting at the top. Separate each row’s entry with a comma. Note: Follow this link for other Cross the Streams. Follow this link for other Cave variations and this link for other classic Caves. If you are new to Cave puzzles, here are our easiest Cave Puzzles to get started on. More Cave puzzles can be found in The Art of Puzzles and in Roger Barkan’s Colossal Cave Collection. 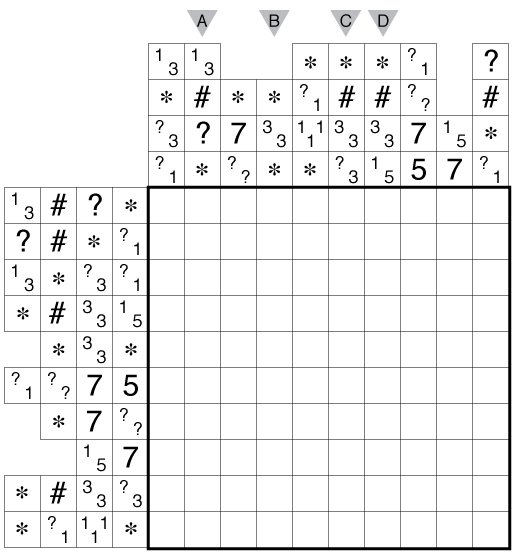 Author/Opus: This is the 85th puzzle from our contributing puzzlemaster Murat Can Tonta. Rules: Standard Cross the Streams rules. 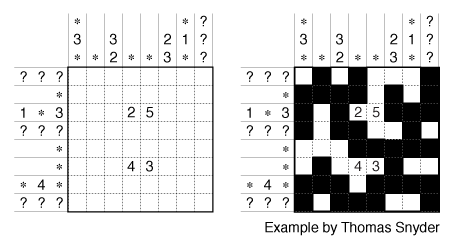 Answer String: Enter the length in cells of each of the black segments from left to right for the marked rows, going in order from A to B to C to D and separating each entry with a comma. Time Standards (highlight to view): Grandmaster = 1:45, Master = 2:45, Expert = 5:30. Note: Follow this link for other Cross the Streams. 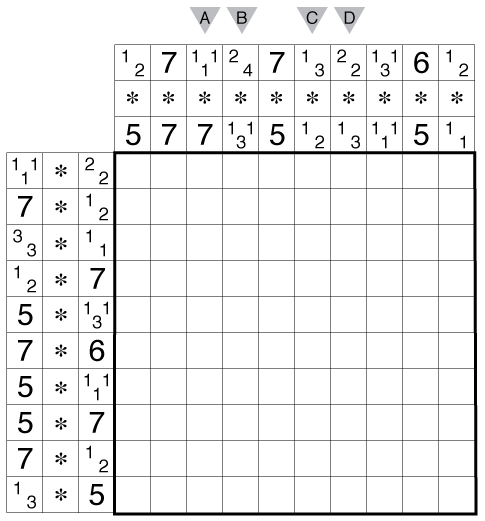 If you are new to this puzzle type, here are our easiest Cross the Streams to get started on. 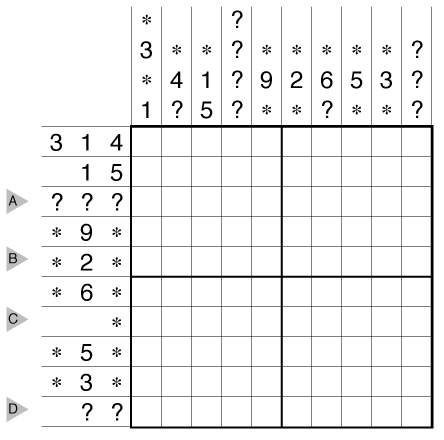 Author/Opus: This is the 5th puzzle from guest contributor Chris Green. Time Standards (highlight to view): Grandmaster = 3:00, Master = 4:00, Expert = 8:00. 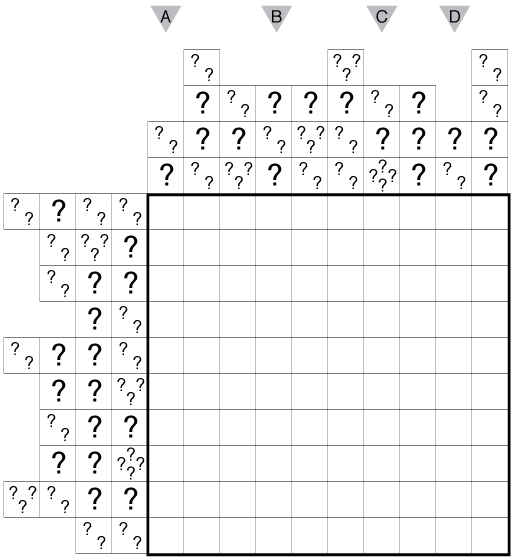 Author/Opus: This is the 172nd puzzle from our contributing puzzlemaster Serkan Yürekli. Time Standards (highlight to view): Grandmaster = 3:15, Master = 5:15, Expert = 10:30.